As a part of our research partnership with Ten-D Innovations, Dr. Alaa AlZoubi, Research Fellow of TenD Buckingham Research and Development Centre, has recently made his second research visit to Shanghai, China. 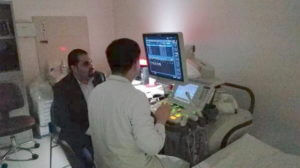 The primary aim of the visit was to meet our end-users for the medical image analysis project. The visit was very successful in terms of knowledge and understanding of the medical applications and development of novel machine learning solutions for solving challenging real-life problems in medical diagnosis. AlZoubi said, “Automatic Cancer Recognition System can provide a second opinion to help in the early cancer detection and increase the chances for successful and timely treatments. Our recent visits provided the perfect opportunity for knowledge sharing between the medical practitioners and computer scientists. 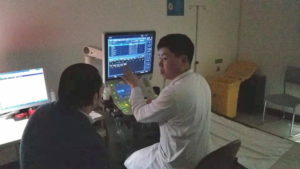 We were able to work closely with expert oncologists to learn more about different types of ultrasound images for a range of cancerous tumours. Our investigation into the way that oncologist extract visual information from the ultrasound images help in the development of our ongoing cancer recognition system”. The Centre Coordinator, Mr Hongbo Du added, “Dr AlZoubi’s visits further strengthen our close collaboration with our partners. Such a close working relationship is essential for the success of the project. Through our hard work, the project has progressed very well, and we will soon reach an important milestone”. Dr Harin Sellahewa, Interim Dean of School, added, “Establishing and strengthening our links with industry and other research institutions are our long-term strategy for growing a strong School of Computing”.